We live together. We work together. We learn together. We are better together. And when we are collaborating, we are at our best. "Phase 3: Community Collaboration" will build on the prior project phases of Exploration and Coordination. Community Collaboration is facilitating community dialogue, sharing skills and knowledge and collaborating toward common goals. It is also, through the creation of a Community Team, improving local communication, decision-making and resource allocation. 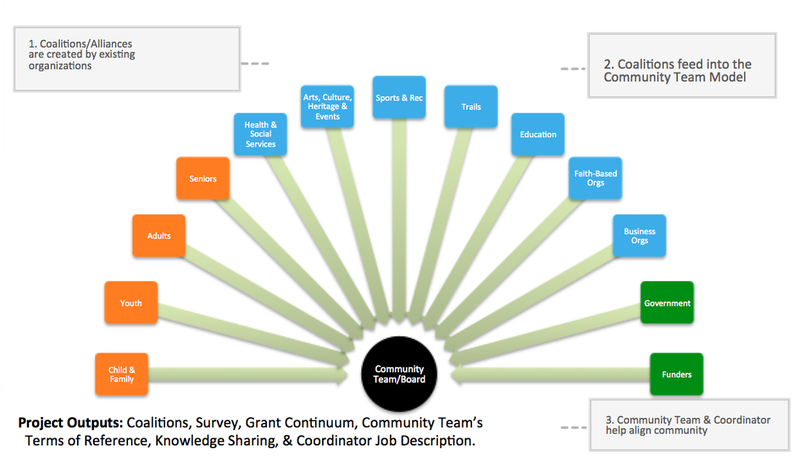 Community Organizations: Community Coordination meetings with local organizations as we build toward a Community Team. Community Leaders: Host 3 Simon Fraser University (SFU) Community Economic Development (CED) courses. This most recent phase of the Community Coordination project, stands on the shoulders of work since 2011. During that period, hundreds of people have participated in related phases (Phase 1 and 2), and supporting project (Age Friendly Community Planning). 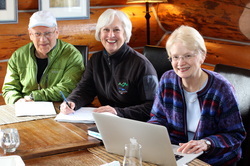 Participation ranges from being aware of the project (hundreds), from attending a public meeting, to making a presentation on an event or organization (100) and even taking a university course (22 at SFU CED course) or leading a sub-sector group (20 from Health & Social Services, Trails, etc.). Also, this project is the only chance for some staff and volunteers to raise above the daily work of their organization to communicate with other groups and share challenges and opportunities. This opportunity has been desired and this project has provided the only capacity to achieve it. Grant applications have finally been approved and these projects are ongoing. Please contact Ryan Watmough at nonprofits.gcrs@gmail.com or 250-344-8610 for more information. 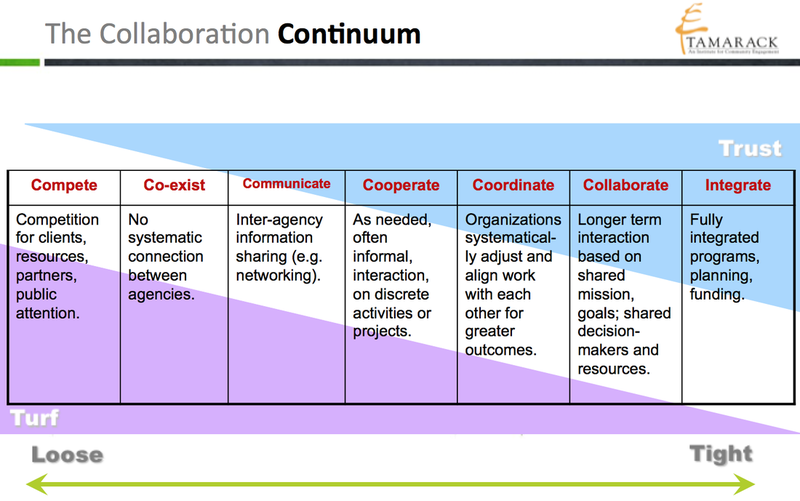 The Collaboration Continuum, developed by the Tamarack Institute, shows how trust and turf are inversely proportional as groups move toward collaboration and integration. Golden's non profit groups and leaders have developed trust since 2011 and moved from co-existence to coordination. The next step is collaboration. The Lifecycle of Emergence diagram above is comprised of two curves, one declining (left) and the other emerging (right). 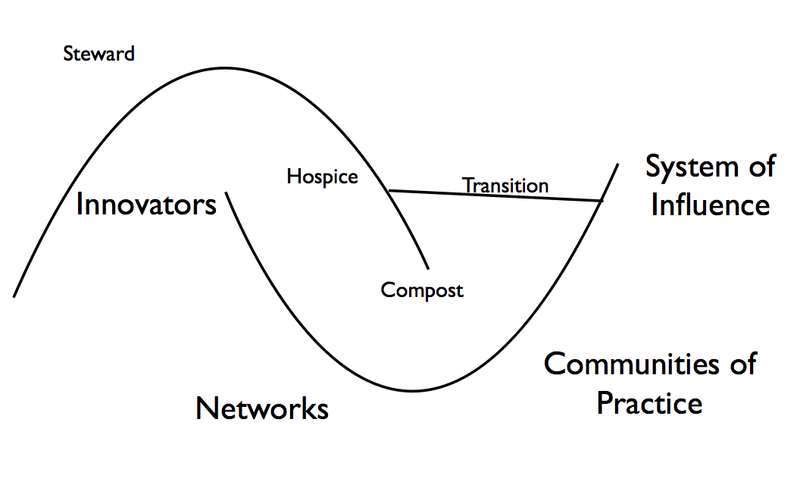 The Community Collaboration project helps those individuals and groups in declining systems to 'transition' themselves and their community knowledge into a new, emergent system. 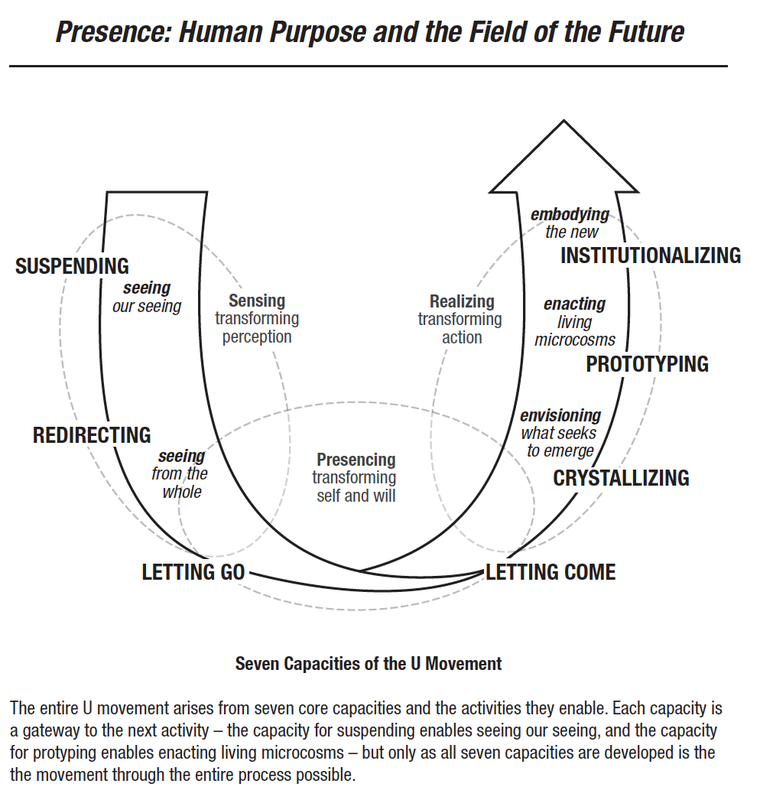 In this model, every one is important and has a role to play through their network, which may change over time. This model was built by Meg Wheatley and Debbie Frieze (Berkana.org, 2006), cited by Dave Pollard (HowToSaveTheWorld.ca, 2010). In order to responsibly build capacity, we need to know which areas to focus on. Which of the physical, psychological, social, cultural, environmental and economic areas should the Golden & Area A community excel in and expand in? And when? That is an excellent task for a Community Team.